The Diane Von Furstenberg label has come a long way since its founder became synonymous with vibrant prints and jersey wrap dresses. With the creative reins handed over to the brand’s first chief creative officer Jonathan Saunders in May last year, DVF has undergone an impressive rejuvenation that has reignited its name for a new generation. In this spirit, the label recently launched a fresh initiative, ’DVF Studio’, which invites emerging artists and designers to collaborate on a collection of one-off or limited edition objects. 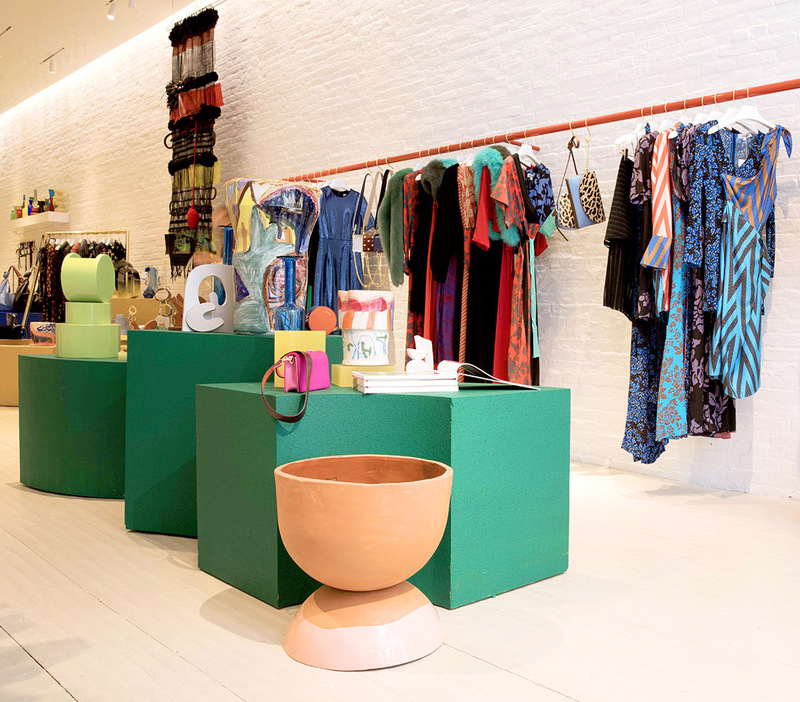 Ranging from artworks, ceramics, and textiles, these pieces are displayed within an evolving space that evokes the feeling of visiting an artist’s studio within the label’s key stores across the US. The special collection is also showcased alongside a curated selection of art books from London’s Carl Freedman Gallery, specialist magazines, vintage glassware, midcentury furniture and an edit of Levi’s and Reebok pieces to underline the label’s love for creative expression. This week, the Venezuelan-born, Brooklyn-based artist Reinaldo Sanguino takes center stage in the label’s Soho boutique in New York with his robust, organically shaped ceramics that are easily recognised by their saturated, abstract designs, all painted freehand. ‘I love Reinaldo’s bold and expressive work, especially his use of colour. His freehand style is so personal and every piece is different,’ Saunders explains. Inspired by the colour palette of DVF’s Autumn/Winter 2017 collection, Sanguino has used bold, painterly strokes to imbue his substantial pieces with clashing patterns, visual textures and an energetic playfulness - all DVF hallmarks - to wondrous effect.